Plymouth University prides itself on helping every student to learn and develop in their chosen area of study, from music to midwifery. It also offers more than 150 extra-curricular opportunities in volunteering, societies and sports clubs. But one slightly different prospect stood out for environmental science student, Chris Brown – the Education through Expeditions (ETE) Leadership Award, led by Explorer in Residence Antony Jinman and funded by Santander Universities. Here, Chris tells his story, describing how, from navigating across Dartmoor to cementing unlikely friendships, he was inspired to embark on his future career. I first heard about the ETE award via social media and, after contacting Antony, I was so pleased that I got a space. 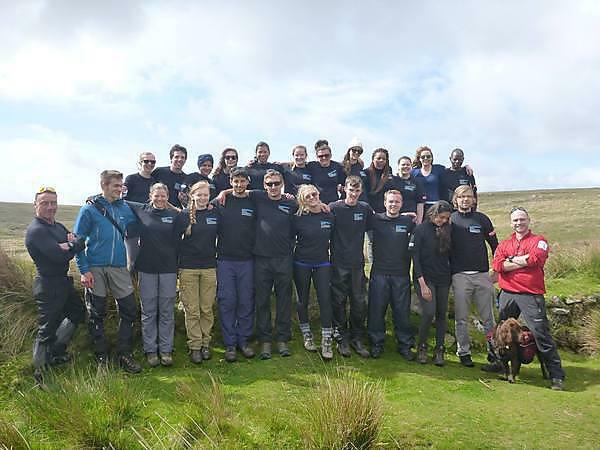 I was in my third and final year of an environmental science degree and thought it would be a really good thing to go and do – much different from anything else you can learn in a seminar or lecture theatre. When we started the course the first thing that struck me was that I only knew one other person there – there were 23 other people I would be spending the next week with, and I had no knowledge of anything about them. Even the person I recognised, who was on the same course as me, wasn't someone I knew well, so it was a bit like starting uni all over again – forming friendships from scratch. However, the first two days were spent group building and we all soon became comfortable in each other’s company. We all did a quiz to see if we were people-focused, task-focused or process-focused. This helped us to learn more about ourselves, and prepare us as thoroughly as possible for our trip up to Dartmoor. Antony also went through exactly what kit we’d be taking and important things to remember. The thing that stuck with me the most is how much I had taken tap water for granted, as we had to take chlorine tablets and purify every bottle of water we collected from the rivers. It was a very long-winded process and I swear I will never take indoor plumbing for granted again. Wednesday and Thursday were the days we actually spent on the Moors, and they were just the best days ever. The weather was beautiful and we walked miles and miles with Antony and another of our leaders, Paul Hart. A bus dropped us off at Ivybridge, and we walked 20km to what felt like the middle of nowhere. We were given a map and had to orienteer in pairs, navigating towards our destination. Each pair took charge of the whole group at least once, using treelines and tops of hills as navigation guides. It wasn’t so much the navigation as the delivering and adjusting to leadership styles which stood out for me, and you could really tell that a good leader inspires their team as well as leading by example. Everyone pulled together and we eventually reached our destination. We camped near an old building, also in the middle of nowhere, and had to set up camp and cook for the night. Despite there being no electricity, some people managed to cook full-on dinners, but I just stuck with stuff from a tin – which was very often what I had at uni anyway. While we waited, Antony and Paul told us stories of their past experiences. Having been to the North and South Poles, Antony’s were fantastic tales – including one involving a polar bear. Paul, as a former paratrooper, also inspired us with his stories, including when he was jumping from an aeroplane and his parachute got stuck. They didn't actually tell us the endings until the Friday, which kept us in suspense for a while. At one point during the night, I stood outside the tent and looked at my surroundings, reminding myself how lucky I was to be here. It had been a fantastic experience so far, made even better by the awesome weather we had. But as I stood there, fog began to set in. Within seconds the area had gone from clear to barely being able to see five feet, and, although it cleared again just as quickly, it made me realise how much we were gaining from this trip. Our expedition would have carried on in spite of the weather, so you really have to be prepared to test your leadership skills and combine as a team. On the Thursday we did some more exercises in first aid, communications and leadership, and walked around 10km. By this point, having been away from water, civilisation and sanitation for more than 24 hours, it struck me how close we’d become as a group. I spent time with some really awesome people, who I probably wouldn't have met any other way. When we came back, we went through all of our experiences and discussed how best we would communicate them on a CV. It’s not just about ‘making lots of friends’ – although that is one of the best things I took away from the trip – but about leading, advising and guiding different types of people through challenging circumstances to a successful conclusion. On top of this, Paul and AJ concluded their stories – I won’t spoil it by telling you how they ended. Although it’s technically after the course, it was during the course that the penny dropped about what I wanted to do after graduating – I was going to do a PGCE in Further Education, Science sector. Completing the ETE Leadership award and being able to guide people in such circumstances, made me realise that I wanted to work with people, and after feeling such a sense of enjoyment outside, I knew I couldn't work in an entirely office-based job. So after I graduated in the summer, I started my PGCE and so far, I love it. I’ve also since heard that Antony offers a longer leadership and communications course as part of the environmental sciences degree – the very course I was studying. I'm gutted I missed it in the curriculum, but I'm incredibly lucky to have done it as an extra course. I know spaces are limited but if you get the chance, apply. It doesn't matter what your background or your subject interests, there’s so much you’ll take away from it. It’s great that ETE and Santander Universities have combined to offer the course in this way, and the experience is something I’ll carry with me for the rest of my life.